The month of November commemorates the faithful departed and souls in purgatory with All souls day falling on November 2nd. We are asked to gain indulgences by, for example, visiting our departed in a cemetery and praying the ‘Eternal Rest / Requiem aeternam’. A reminder to all Brother Knights, regarding the “Early Bird” draw for your annual Council Dues. If you pay your 2017 Council reminder to all Brother Knights dues of $40 before the start of the December meeting, you are entered into a draw to win back your membership fee. This draw will beheld during the New Business section of the meeting. If you have not yet paid your 2017 dues – payment may be made by cheque or in cash to the Financial Secretary. All cheques should be made payable to: “Knights of Columbus – Council 11098”. You may leave your payment in an envelope, in the “IN” box outside of the Church Office, addressed to Reid Robertson. If paying by cash, please include a note with your name. Your new 2017 membership card will be given to you at the next Council meeting, or then mailed out afterwards if not picked up. – -7:00 pm We will have new Brother candidates take their Admissions Degree for St. Isaac Jogues council. ALL are welcome to attend & support our brotherhood. dvdeasson@yahoo.ca Please join your brothers, remember and pray for our deceased fellow brothers of our Council. All are encouraged to attend with reception in Hall after Mass. Join your Brothers from St. Isaac’s & Holy Redeemer Councils with our popular annual Nativity float entry in this year’s parade that serves to ‘Keep Christ in Christmas’. The parade floats start on Dixie then E. on Glenanna to the Mall. Sat. Nov. 26th Pasta Bingo Night is Back! Parish Hall starting after Mass. dvdeasson@yahoo.ca Join us for a Mass followed by lighting of our crèche and tree. Come with your children and join us for this popular annual Family Christmas Party. There will be Music, Magicians and more including a special guest from the North Pole with presents. 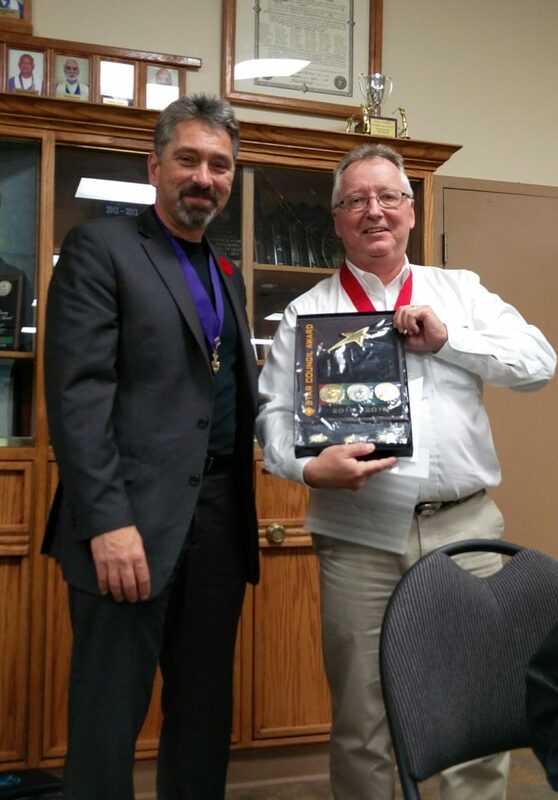 Knights of Columbus Council 11098 of St. Isaac Jogues Church, Pickering, ON has earned the distinction of Star council, one of the organization’s top awards, for the 2015-2016 fraternal year. The organization’s headquarters, located in New Haven, Connecticut, made the announcement. The award recognizes overall excellence in the areas of membership recruitment and retention, promotion of the fraternal insurance program, and sponsorship of service-oriented activities. The award was presented to the membership by District Deputy Terry Wood at a special ceremony held on Tues. Nov. 1. 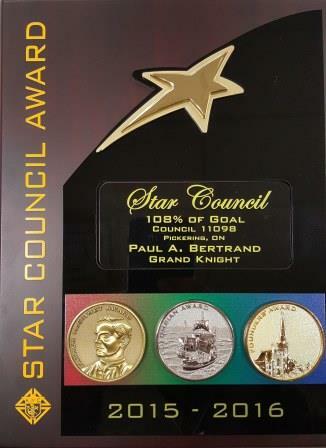 “Receiving the Star Council Award is quite an honour for us. We’re extremely proud of this accomplishment,” proclaimed Sir Grand Knight Paul Bertrand, head of the local council. The Knights of Columbus is the world’s largest Catholic lay organization. It provides members and their families with volunteers’ opportunities in service to the Church, their communities, families and young people. With more than 1.9 million members in over 15,000 councils around the world, the Knights of Columbus annually donates more than $175 million and 73 million hours of service to charitable causes. Please visit www.kofc.org for more information. Presenter District Deputy Terry Wood and Sir Grand Knight Paul Bertrand. With All Saints Day Mass starting at 7:00 PM Tues. Nov 1st, we will start the meeting a little later after Mass or about 7:45 – 8:00 p.m.
Join our 4th Degree Honour Guard and pay tribute to all war veterans and fallen comrades during the Remembrance Day parade, KofC 11098 will lay wreaths for our Council & Squires. We will have new Brother candidates take their Admissions Degree for St. Isaac Jogues council. ALL are welcome to attend & support our brotherhood. Please join your brothers, remember and pray for our deceased fellow brothers of our Council. All are encouraged to attend with reception in Hall after Mass. Join us for a Mass followed by lighting of our crèche and tree. The month of October is dedicated to the rosary and Mary, Queen of the Holy Rosary. It is among the best known of Catholic devotions celebrated by simply praying the rosary. You will notice Membership Drive events below led by Chair Blair Sears. Please contact Blair at blair_k_sears@icloud.com or call 416. 208.7038 if you are interested in supporting the Membership Committee which is critical to the sustainment & growth of our Council. Any assistance is appreciated. Assist our Council in recruiting new Brothers to the Knights. Info brochures distributed after each Mass. Pulpit Speech at each Mass. Brothers can assist by getting names, encourage membership. All Brothers welcome to assist & attend in set up, preparations and support our potential new brothers wishing to become Knights of Columbus members. Our council team will conduct the Admissions Degree – for St. Isaac Jogues new candidates & surrounding councils. ALL brothers are encouraged to attend as support our brotherhood. Prize money for the winners & proceeds benefiting our charity for the evening. Last of the season. Knights across Canada & the US honor the month of the Holy Rosary by leading rosary prayers.